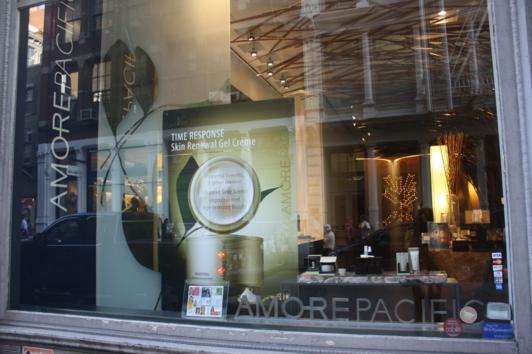 What better way to end a week than to get a facial at the very Zen Amorepacific Spa in Soho? This was my afternoon, yesterday, and I was a bit nervous. See, I’ve never had a facial done. I have very sensitive skin on my face and I’ve never trusted it with anyone before. I spent most of my 20s and all of my teens trying to survive pimples and acne. Now that I’m in my 30s, I’ve fallen into an agreement with my skin. I use the best anti-aging products I have and my face agrees to not embarrass me. So, I was pretty nervous to entrust my face to someone else. As it turned out, I had no need to worry. My aesthetician, Andrea, was so Zen. She was polite and soft-spoken but carried an authority of someone who has mastered her job and loves it. I usually hate speaking through massages but her voice was so gentle and the surroundings so peaceful that I actually enjoyed talking with her. She asked about my concerns and tailored the facial to suit my needs. She started by directing a steam machine on my face. This provided gentle puffs of steam, opening up the pores. I told her about my routine and she recommended I use toner. This apparently balances the pH of the skin. Andrea cleansed my face thoroughly and interjected the treatment with deep massages. She also applied a green tea facial. The aroma of green tea gently enveloping me added to an absolutely peaceful experience. Andrea used Amorepacific Moisture Bound Vitalizing Masque, Time Response Eye Renewal Creme and Time Response Skin Renewal Gel Creme. My experience was nothing short of blissful and absolutely delightful. Andrea seemed born to be an aesthetician, in that her manner and skills seemed effortless. To schedule an appointment at the Amorepacific spa, click here. Ask for Andrea. You won’t be disappointed. Facial was gifted at a previous event. I’m really glad you enjoyed your first ever facial, i was pretty nervous before i had my first ever microdermabrasion in the UK – mostly in a vail way (I didn’t really want anyone to see my face completely stripped bare of all its make up!) It was well worth it though, and made me think much harder about how i treat my skin.